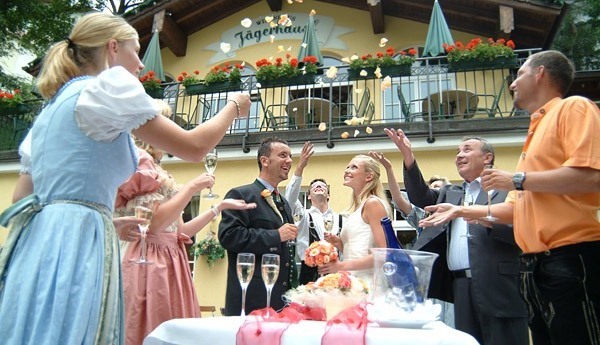 Our RCI resort at Bad Gastein was Hotel Bellevue of the Mondi group of Hotels. The group has 5 hotels in the area which are absolutely jam packed during the Skiing season which starts from Nov and continues up to March. Built in 1831 as a Spa the Bellevue is a luxury hotel catering to ski guests. The restaurant serves good food along with excellent beer during the daily dinner buffet. At the back of the resort about 200 ft below is another Resort Restaurant called Jagger Haus which served excellent Austrian beer. The waitress in Bavarian dress was surprised that my wife refused the beer ,preferring the water instead. She did not know that it was the holy fasting period of Nav Durge when Indians are supposed to fast for 9 days. We needed to purchase some groceries and the helpful waitress guided us by pointing upwards and said go up and up and up............. We had to do just that ,and it was a steep climb. Our unit No 1002 ,on the ground floor consisted of a Living room on the upper level and a bedroom on the lower level. On the ground floor was our kitchen and dining area. Extremely comfortable. It was one the good accomodations we have enjoyed courtesy RCI. The balcony of the living room ,opening in front of tall pine trees, was the perfect place to enjoy the October Alpine weather. Bellevue Mondi was established in the ninteenth century as an upper class spa for water treatement.Water treatment was the only sucessful cure for rheumatism ,arthritis and blood pressure etc and therefore the rich and the famous of Europe came to Bad Gastein to take the waters and get relief. By the twentieth century medical science had provided better and sure shot cures for most of the diseases and Bad Gastein changed to a Ski Resort and accordingly Bellevue Mondi changed from a Spa to a modern hotel with all weather swimming pools instead of spas.